The AOL founder has no authority to interfere in the matter. 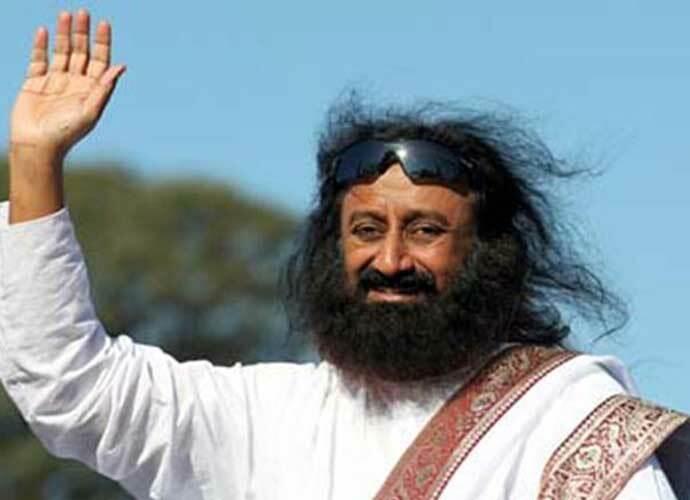 If the Ram temple issue in Ayodhya is not resolved, says Art of Living (AOL) founder Sri Sri Ravi Shankar, "India will turn into Syria." He believes the resolution cannot come through the Supreme Court of India. Instead, it has to "come through dialogue", and he seems to have taken the initiative. As the ominous remarks took the shape of a controversy, with political leaders speaking out against Ravi Shankar and AIMIM leader Asaduddin Owaisi demanding an FIR, the AOL founder clarified on March 6 that he could not even “dream of making a threat” and was “scared of the possibility of violence”. “My statement was wrongly interpreted. I am very confident that Ayodhya dispute will be resolved,” he said, adding, for some reason, that “the media introduced the Syria twist in the statement”. Did the AOL founder think that was the only problematic part of his remarks? Even without invoking the spectre of Syria – where a raging civil war has claimed more than 600 lives in the past two weeks alone – Ravi Shankar’s statements seem to make two worrying assertions: that the Supreme Court is incapable of solving the Ayodhya dispute, and that the only way for Muslims to “avoid bloodshed” is to give up their claim on Ayodhya. This in turn leads to two questions – at what point does “negotiation” turn into coercion, and more importantly, why exactly is Ravi Shankar involved in the Ayodhya dispute? The Ram Janmabhoomi-Babri Masjid title suit is being heard by the Supreme Court, after the parties concerned appealed against the Allahabad High Court’s 2010 judgment of dividing the disputed land into three parts – one each for the Sunni Wakf Board, the Nirmohi Akhara and Ram Lalla. For all his claims, Ravi Shankar is by no means a “neutral” figure. He is a Hindu religious guru, who has not been invited to be a part of the legal battle by either the court or any of the litigants of the title suit. He, therefore, has no locus standi to speak on the case. The primary players in the case have rejected his involvement – while the Nirmohi Akhara has denied Ravi Shankar’s claims that they held a meeting on the issue, the All India Muslim Personal Law Board (AIMPLB) has expelled cleric Syed Salman Hussain Nadvi, who had met the AOL founder and said that shifting the mosque was permissible. Ravi Shankar’s involvement, thus, so far seems to have served one purpose – adding to the momentum being built to “settle” the case outside the court. The justice’s statements, in fact, illustrate exactly why the Ayodhya dispute must be settled only in court, and random mediations, such as the latest by Ravi Shankar, firmly discouraged. The Ram Mandir-Babri Masjid issue is indeed one of “sentiments and religion”, the stoking of which has led to some of the worst scars on Indian society since the Partition – the Babri Masjid demolition, the subsequent riots, the Godhra massacre, and the terrible bloodbath in Gujarat that followed. By skilfully drawing mileage from the issue, the BJP has also scripted phenomenal poll successes, several times over. Today, the saffron party is ruling the country — particularly Uttar Pradesh, the site of the dispute — with an overwhelming majority. 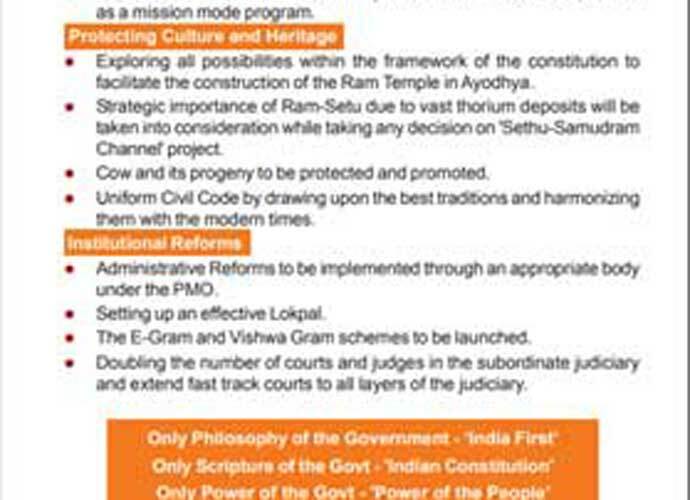 The BJP promised a Ram Mandir in Ayodhya in its 2014 Lok Sabha polls manifesto. For “negotiations” to proceed, there has to be at least a semblance of equality between the two aggrieved parties. What pretence of equality can Muslims enjoy when the ruling BJP has been promising a Ram Temple in its poll manifestos since 1989, and its leaders have been announcing that a “grand temple” will come up at Ayodhya, even as the case is sub-judice? Only a court of law, through its constitutional bindings, can guarantee equality to all parties in the case, and it should be the only body deciding on the case. The Out-of-court Ayodhya Settlement Proposal that Ravi Shankar has thought fit to draw up, on absolutely no authority, and shared with a TV channel, is a misguided document, lopsided to favour the majority. In the first scenario is a casual assertion – “archeological evidence” – showing “that the temple existed long before the Masjid”. It is important to mention here that questions have been raised about its veracity. The second scenario is the land being “gifted” to Muslims, suggesting they have no real claim over it, and their victory in the case would merely be the court’s largesse. The “loss of goodwill”, as suggested by Ravi Shankar, is nothing but a threat. Also, the insinuation that Hindus will not respect the court’s verdict and resort to violence is an insult to the community. Ravi Shankar is a religious guru, a popular figure in the country and abroad. It ill-behoves him to resort to bullying and fearmongering. The way his “negotiations” have so far proceeded, they are less an attempt to resolve the dispute than to get the Muslims to swallow their lot with good grace. The RSS or the VHP – known votaries of a Hindu Rashtra – making such statements is one thing. Figures like Ravi Shankar, perceived as the softer, more sophisticated proponents of Hinduism, talking about “blood on the streets” normalises the idea that Muslims are second-class citizens who need the majority community’s blessings to live in safety. It is the government’s job to uphold the rule of law in the country. It should curb all attempts by any individual citizen or body to interfere with the domain of the court. The Ayodhya dispute has long been an acid test for India’s secularism and democracy. The intervention of influential public figures like Ravi Shankar is an attempt to “fix” a very high-stakes match. The art of living peacefully has no place for the craft of majority dominance. Also read: 14 years of BJP rule in Madhya Pradesh: Will Congress pull through?